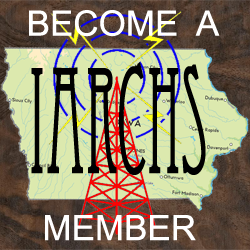 Join IARCHS, Membership in the Iowa Antique Radio Club & Historical Society is Free, membership is moderated, so once you apply must be approved by one of our site moderators before you can actually log on to the site. This step is necessary to eliminate Spammers, Scammers and BAD ROBOTS. We reserve the right to cancel individual membership privileges when needed to maintain civility online.